The entity that's conducting the most extreme and far-reaching surveillance against most of the world's communications—the National Security Agency—is bound by United States law. For years, we've been working on a strategy to end mass surveillance of digital communications of innocent people worldwide. Today we're laying out the plan, so you can understand how all the pieces fit together—that is, how U.S. advocacy and policy efforts connect to the international fight and vice versa. Decide for yourself where you can get involved to make the biggest difference. The National Security Agency is working to collect as much as possible about the digital lives of people worldwide. As the Washington Post reported, a former senior U.S. intelligence official characterized former NSA Director Gen. Keith Alexander's approach to surveillance as "Collect is all, tag it, store it… And whatever it is you want, you go searching for it." The NSA can't do this alone. It relies on a network of international partners who help collect information worldwide, especially the intelligence agencies of Australia, Canada, New Zealand, and the United Kingdom (collectively known, along with the United States, as the "Five Eyes.") In addition, the United States has relationships (including various levels of intelligence data sharing and assistance) with Belgium, Denmark, France, Germany, Israel, Italy, Japan, the Netherlands, Norway, Singapore, Spain, South Korea, Sweden, and potentially a number of other countries worldwide. There are also other countries—like Russia, China, and others—engaging in surveillance of digital communications without sharing that data with the NSA. Some of those governments, including the U.S. government, are spending billions of dollars to develop spying capabilities that they use aggressively against innocent people around the world. Some of them may do so with even less oversight and even fewer legal restrictions. So what do we know about major tech companies, like Google, Facebook, Yahoo, and Microsoft? Here we have mixed reports. Documents provided by Edward Snowden and published in the Guardian and the Washington Post name nine U.S. companies—Microsoft, Yahoo, Google, Facebook, PalTalk, AOL, Skype, YouTube, and Apple—as participants in the NSA's PRISM program. The documents indicate that the NSA has access to servers at each of these companies, and implies that these companies are complicit in the surveillance of their users. So how do we get tech companies to start fighting surveillance in court, hardening their systems against surveillance, pushing back against the administration, and lobbying for real reform? We're focused on transparency—uncovering everything we can about the degree to which big tech companies are actively helping the government—and public pressure. That means highlighting ways that companies are fighting surveillance and calling out companies that fail to stand up for user privacy. We also need to cultivate a sense of responsibility on the part of all those who are building products to which the public entrusts its most sensitive and private data. The people who create our computing devices, network equipment, software environments, and so on, need to be very clear about their responsibility to the users who have chosen to trust them. They need to refuse to create backdoors and they need to fix any existing backdoors they become aware of. And they need to understand that they themselves, unfortunately, are going to be targets for governments that will try to penetrate, subvert, and coerce the technology world in order to expand their spying capabilities. They have a grave responsibility to users worldwide and we must use public pressure to ensure they live up to that responsibility. We've already translated the materials into Spanish and Arabic, and we're working on even more translations. We'll continue to expand these materials and translate them into as many languages as possible, while also doing a public campaign to make sure as many people as possible read them. Many of the tools that are using security best practices are, frankly, hard to use for everyday people. The ones that are easiest to use often don't adopt the security practices that make them resilient to surveillance. We want to see this problem fixed so that people don't have to trade usability for security. We're rolling out a multi-stage Campaign for Secure and Usable Crypto, and we kicked it off with a Secure Messaging Scorecard. The Secure Messaging Scorecard is only looking at a few criteria for security, and the next phases of the project will home in on more challenging security and usability objectives. Most people haven't even heard of it, but Executive Order 12333 is the primary authority the NSA uses to engage in the surveillance of people outside the U.S. While Congress is considering much-needed reforms to the Patriot Act, there's been almost no debate about Executive Order 12333. We've already launched the first phase of our campaign to reform Executive Order 12333. Application of Human Rights to Communications Surveillance, which features 13 guiding principles about limiting surveillance. Written by academics and legal experts from across the globe, the principles have now been endorsed by over 417 NGOs and 350,000 individuals worldwide, and have been the basis for a pro-privacy resolution successfully passed by the United Nations. The 13 Principles, as they're also known, are also meant to work both locally and globally. By giving politicians and activists the context for why mass surveillance is a violation of established international human rights law, they make it clear that legalizing mass surveillance—a path promoted by the Five Eyes countries—is the wrong way forward. The 13 Principles are our way of making sure that the global norm for human rights in the context of communication surveillance isn't the warped viewpoint of NSA and its four closest allies, but that of 50 years of human rights standards showing mass surveillance to be unnecessary and disproportionate. Katitza Rodriguez, EFF's International Rights Director, is rarely in our San Francisco office. That's because the majority of her time is spent traveling from country to country, meeting with advocacy groups on the ground throughout Latin America and parts of Europe to fight for surveillance law reform. Katitza and the rest of EFF's international team assist these groups in working to build country-specific plans to end mass surveillance at home and abroad. The goal is to engage activists and lawyers worldwide who can use the 13 Principles and the legal analyses we've prepared to support them at the national level to fight against the on-going trend of increased surveillance powers. For example, we teamed up with activists in Australia, Mexico, and Paraguay to help fight data retention mandates in those countries, including speaking in the Paraguayan National Congress. We've been sharing with and learning from groups across the world a range of different tactics, strategies, and legal methods that can be helpful in uncovering and combating unchecked surveillance. Our partners are starting to develop their own national surveillance law strategies, working out a localized version of the Who Has Your Back campaign, evaluating strategic litigation, and educating the general public of the danger of mass surveillance. In certain locales, these battles are politically and socially difficult, in particular in places where a culture of fear has permeated the society. We've seen anti-surveillance advocates wrongly painted as allies of pedophiles or terrorists. In at least one of the countries we're working in, anonymity is forbidden in its constitution. For some of our partners, promoting a rational debate about checking government power abuses can risk their very freedom, with activists facing jail time or even more serious consequences for speaking out. Establishing a bottom-up counter-surveillance law movement—even if it's one based on common sense and the entire history of modern democracies—isn't easy. It's a titanic task that needs the involvement of advocates around the world with different tactics and strategies that are complementary. This is why we've also been working to make connections between activists in different countries, with case studies like the Counter-Surveillance Success Stories, and highlighting individuals who are proud to stand up and say "I Fight Surveillance." We're also teaming up with partners, such as Panoptykon Foundation, to share the strategies and tactics they used in Europe with local groups in Latin America and vice-versa. We're working closely with groups in the Middle East and North Africa, such as 7iber and SMEX, to track, report on, and coordinate responses to state surveillance in these regions. All of this has helped inform the work we've done in venues like the United Nations, the Office of the High Commissioner on Human Rights, and the Inter-American Commission on Human Rights, where EFF and our allies are helping—with great success—the legal minds there wrap their heads around this new age of state violations of the right to privacy and free expression. Executive Order 12333 may be the presidential command that sets the agenda for mass surveillance, but U.S. law also plays a huge role. The NSA claims (often wrongly) that certain U.S. laws allow surveillance of all Internet users, with almost zero oversight of its spying on non-U.S. persons. There's the FISA Amendments Act, which the NSA believes allows it to spy on groups of people instead of with directed warrants and scoop up all of the Internet traffic it can, and grants it carte blanche to target anyone overseas on the grounds that they are potentially relevant to America's "foreign interests." And then there's the Patriot Act, which has been loosely interpreted by the NSA to permit the dragnet surveillance of phone records. You can read more details about American law in our addendum below, but here's the upshot: we have to fix the law if we're to stop these secret agencies spying on the world. And we have to make sure that no new tricks are being planned. One of the greatest challenges we face in attempting to end mass surveillance is that we don't know what we don't know. Thanks to whistleblower evidence, statements by certain public officials, and years of aggressive litigation under the Freedom of Information Act, we've confirmed that the NSA is engaged in mass surveillance of our communications and that it is primarily relying on three legal authorities to justify this surveillance. But what if the NSA is relying on seven other legal authorities? What if there are other forms of surveillance we have not yet heard about? What if the NSA is partnering with other entities (different countries or different branches of the U.S. government) to collect data in ways we can't imagine? It's extremely difficult to reform the world of surveillance when we don't have a full picture of what the government is doing and how it's legally justifying those actions. Working to reform the broken classification system, which keeps the government's actions hidden from public oversight. Mass surveillance affects people worldwide, reaching everywhere that the Internet reaches (and many places that it doesn't!). But laws and court systems are divvied up by jurisdictional lines that don't make sense for the Internet today. This means we need a range of tactics that include impact litigation, technological solutions, and policy changes both in the United States and across the globe. This game plan is designed to give you insight into how U.S. laws and policies affect people worldwide, and how we can work to protect people outside of America's borders. We're up against more than just a few elements in the American administration here. We're up against a growing despondency about digital privacy, and we're up against the desire of spooks, autocrats, and corporations jockeying for intelligence contracts in every nation, all of whom want to shore up these surveillance powers for themselves. But we work side-by-side with hundreds of other organizations around the world and thousands of supporters in nearly every country. We have the amazing power of technology to protect privacy, organize opposition, and speak up against such damning violations of human rights. We're continuing to refine our plan, but we wanted to help our friends understand our thinking so you can understand how each of our smaller campaigns fit into the ultimate objective: secure, private communications for people worldwide. It's what we're doing to fight surveillance. But what can you do? You can join your local digital rights organization, of which there are now hundreds, in almost every nation (and if there isn't one in yours, ask us for advice on starting one). You can pressure companies to increase your protection against government espionage and support companies that make a stand. You can sign our petition about Executive Order 12333 and help spread the word to others. You can use encryption to protect yourself and raise the cost of mass surveillance, and you can teach your friends and colleagues to use it too. You can personally refuse to cooperate with surveillance and promote privacy protections inside institutions you're a part of. You can tell your friends and colleagues the real risks we are running and how we can turn this mess around. And whether you're in the United States or not, you can support our plan by becoming a member of EFF. One of the best ways to end mass surveillance by the NSA is to change the United States law to make clear that warrantless surveillance is illegal. However, that's a little challenging. The NSA is relying on a patchwork of different laws and executive orders to justify its surveillance powers. What it does: The section of the law basically says that the government can compel the production of any "tangible things" that are "relevant" to an investigation. Why you should care: The NSA relies on this authority to collect, in bulk, the phone records of millions of Americans. There are suggestions it's also being used to collect other types of records, like financial records or credit card records, in bulk as well. However, there's an even easier way to defeat this provision of the law. This controversial section of the Patriot Act expires every few years and must be reauthorized by Congress. It's up for renewal in June 2015, which means Congress must successfully reauthorize the section or it will cease to be a law. We're going to be mounting a huge campaign to call on Congress not to reauthorize the bill. Why you should care: The NSA relies on this law to support PRISM, which compels Internet service providers like Google, Apple, and Facebook to produce its users communications. The NSA's upstream surveillance—which includes tapping into fiber optic cables of AT&T and other telecommunications providers—also relies on this provision. Through these two surveillance options, the NSA "targets" subjects for surveillance. But even when the NSA is "targeting" specific foreign intelligence subjects overseas, they're "incidentally" collecting communications on millions of people, including both Americans and innocent people abroad. How we can stop it: Currently, there aren't any reform bills that show promise. We're working on educating the public and Congress about the Section 702 and the FISA Amendments Act. In 2017, this authority will be up for reauthorization. We'll be planning a big campaign to demolish this invasive and oft-abused surveillance authority. What it does: Executive orders are legally binding orders given by the President of the United States which direct how government agencies should operate. Executive Order 12333 covers"most of what the NSA does" and is "the primary authority under which the country's intelligence agencies conduct the majority of their operations." Why you should care: Executive Order 12333 is the primary authority the NSA uses to conduct its surveillance operations—including mass surveillance programs—overseas. 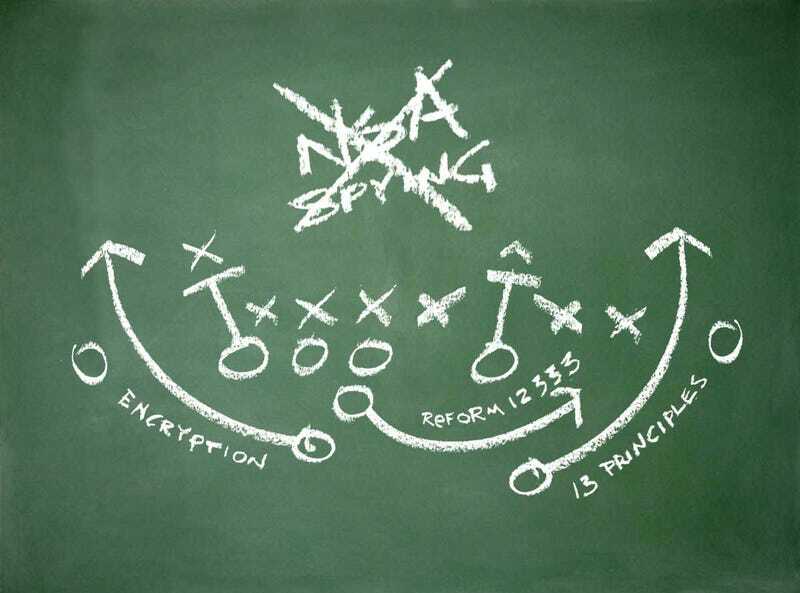 Reforming mass surveillance requires reforming the NSA's authority under EO 12333. How we can stop it: Executive Order 12333 was created by a presidential order, and so a presidential order could undo all of this damage. That's why we're pressuring President Obama to issue a new executive order affirming the privacy rights of people worldwide and ending mass surveillance.